With the team behind the success of Batman: the Animated Series now busy with the Justice League, WB went looking for a new approach to the Dark Knight for its new cartoon. Just like this summer's Batman Begins, the cartoon takes a look at a younger Batman, one who's still learning his way around Gotham City's seamy underbellly. Of course, no Batman enterprise would be complete without a toyline tie-in, and The Batman is indeed a Batman enterprise. Mattel is creating dozens of figures based on Jeff Matsuda's designs, from the plain vanilla Batman to the more extravagant MechaThunder Nite-Strike Desert Armor Batman. But oddly enough, one of the variant figures is actually a pretty decent buy. Now, yes, we often talk about how stupid endless costume variations are, but this is a rare exception. 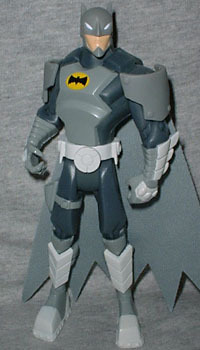 For once, Mattel didn't create some neon Day-Glo nightmare - instead, Power Net Batman is a nice muted gray. Even the design of his armor is nicely subdued. He's got big plates on his shoulders, but even they're not too ostentatious. The rest of his armor hugs the body, almost like a SWAT uniform; thick gloves, chest armor, kneepads, shin guards... it's all stuff that looks like something Batman would actually wear rather than something somebody designed. The figure's biggest weakness might be the colors. As one reader pointed out, the light grays make the costume look like a mouse - Batman usually goes for the darker shades. But when I look at it, it reminds me most of Frank Quitely's design for Owlman in the Earth 2 graphic novel. A bit of cutting on the cape, a bit of molding on the head and you'd have a fine customized version of Bruce Wayne's evil twin. In any case, this is a much better toy in gray than it would be in tiger-stripe yellow. Power Net Batman stands 5 1/2" tall and moves at the neck, shoulders, elbows, waist, hips and knees. He's got an action feature in his right arm, but it doesn't impair the movement: raise his arm up until it clicks, then press the button beneath his cape to whip it back down. It's nothing really new, but by putting several "intermediate" stages before the final click, you can still pose the figure. Even better, the button is about as unobtrustive as you could ever want. 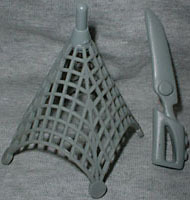 The "Power Net" of the figure's name is a plastic piece that fits loosely in Batman's hand; the action feature is supposed to throw it, but it doesn't go too far. Fortunately, the motion works well with PNB's other accessory, a 3" gray sword. It fits in his hand much better, and the action feature gives it a mighty chop. So, nice design, appropriate colors, an action feature that doesn't get in the way... Power Net Batman is a variant the way variants should be done. Hell, if more of them were like this, people probably wouldn't mind the things so much. How'd Mattel let a good one slip through? Tell us on our message board, The Loafing Lounge.